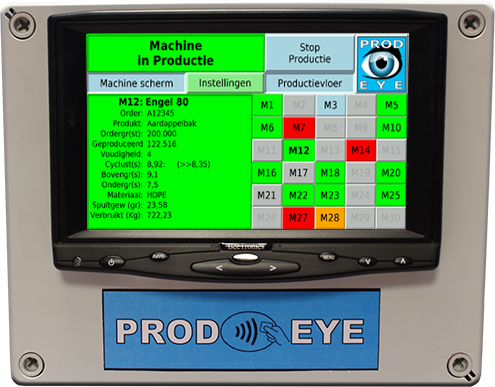 PROD-EYE is a production monitoring and guarding system, developed in the Netherlands. It was built using previous experiences with other monitoring and MES systems (Manufacturing Executing Systems). PROD-EYE offers all employees and management staff a live view into the production status and history of your machinery. In only a few days, employees will go from layman to specialist. Contrary to a lot of other monitoring systems or MES-systems, where training and implementation can take up to months or even more than a year. The short learning cuve prevents possibly demoralizing employees. Complex systems are more often than not underutilized or crash prematurely, which obviously leads to a disinvestment. Every screen will also give a live feed of the status of all other machines equipped with a PROD-EYE module. 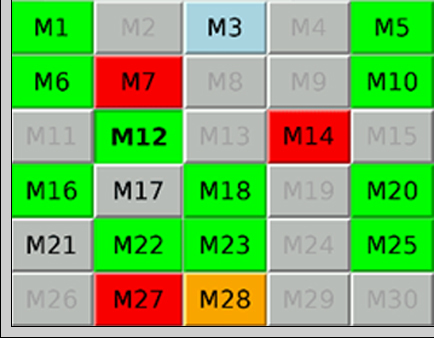 This means, no matter which machine you are looking at,you will always have a full view of your production status, making unnoticed machinery malfunction a problem of the past. PROD-EYE can be implemented extremely fast because of its user-friendly build. Every machine you want to monitor will be equipped with a PROD-EYE module comprised of a touch screen, a microcomputer and intelligent electrionics, combined in one compact case. Installation: The module requires a 230 volt power supply as well as a basic signal, for which it will use the cycle pulse of the machine it is attached to. The network connection can be fed into your company’s computer network (or, if desirable, a seperate network). Any additional PROD-EYE modules can be connected in the same manner. The new module will automatically recognize and connect to other modules in the network, and vice-versa. All you have to do now is manually type in the machinenr. for the corresponding machine and your PROD-EYE network will be up and running. The touch screen is available in different sizes. the standard version is 7″ but 10″ or even larger screens are also available. A central screen on which every machine can be viewed is also easily realized. PROD-EYE WEB offers a direct, live view into the production status of your machinery, no matter where you are, through an internet connection.. 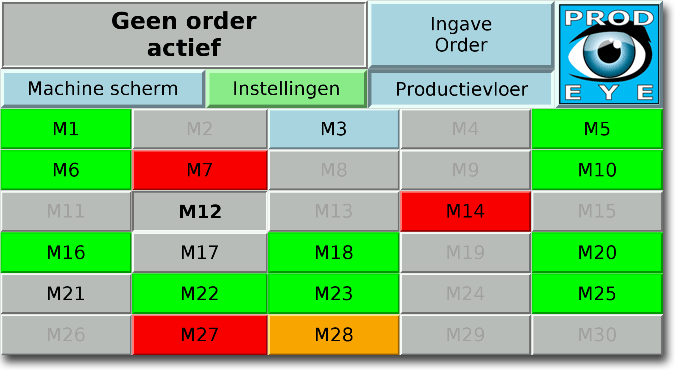 In addition, there is the possibility to remotely change order settings, and even start or stop new orders. The current status of all machines equipped with a PROD-EYE module can be viewed. No matter where you are, you will always have a complete overview of your production on your PC, tablet, or smartphone, making unnoticed machinery malfunction a problem of the past.